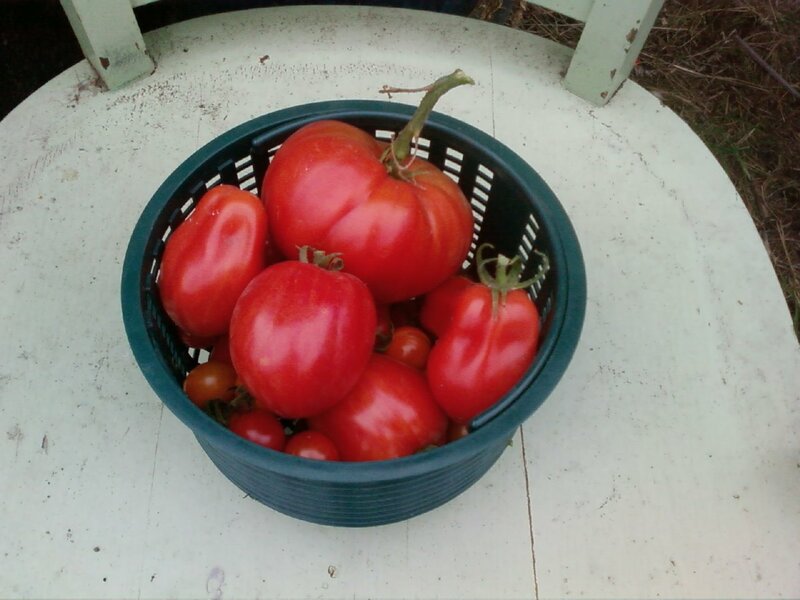 In my estimation, the worse thing about planting tomatoes in the beginning of the season is cleaning them out of the beds at the end of the season. After trying to squeeze the last bit of redness out of this year's crop (as any good gardener in this area would do) the first frost last night prompted me to finally cave and I spent the morning cutting out vines and pulling up stakes. 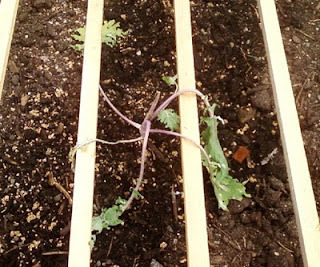 The clamps that were holding the stems up on the stakes were maxed out and difficult to remove. I saved all of the tomatoes worth keeping, red and green, and piled them in a large bucket. Not surprisingly, this load was probably my largest crop. Anyone who's tried to grow tomatoes in this region knows what I'm talking about. The carnage left behind looks rather disheartening though; many of the cherries and red zebras had ripened but split due to all the recent rain. There they lay all over the ground and the bed. 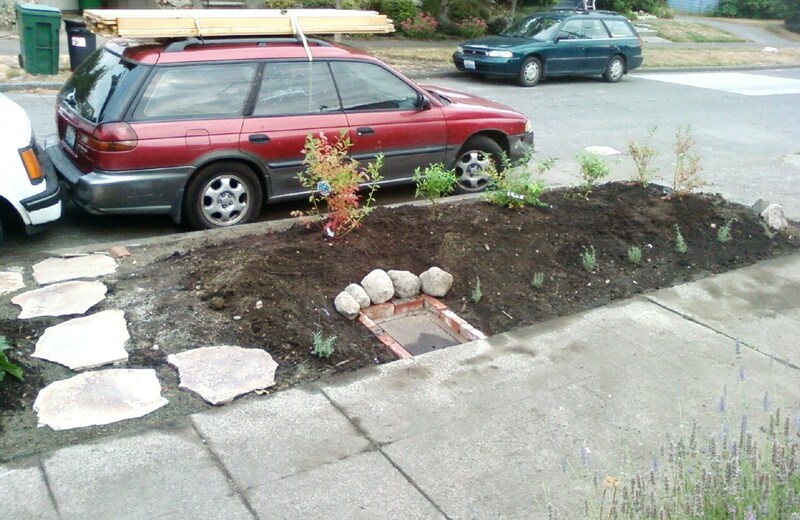 Now I'll have to clean them up or I'll have rogue plants coming up next spring. In the mean time, squish, squish, squish getting around the beds. 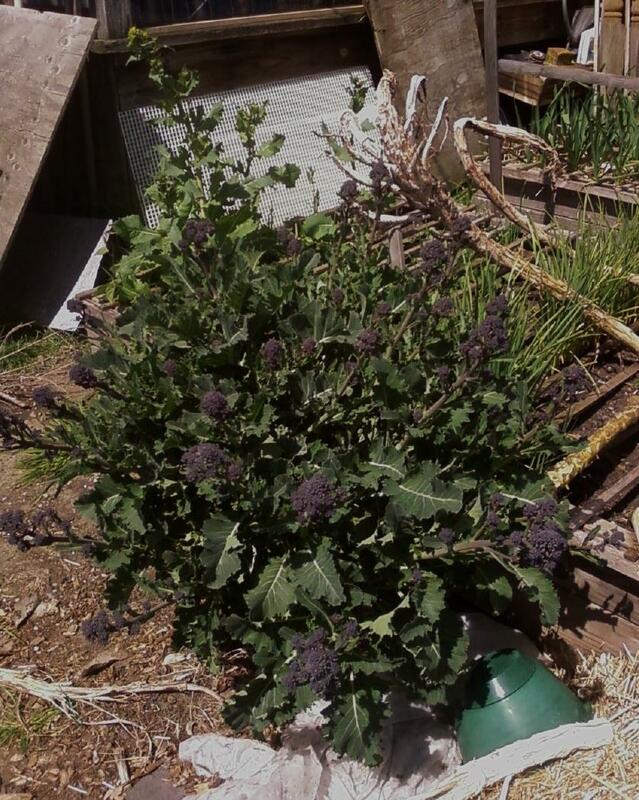 Purple sprouting broccoli - it's baaaack. The tomatoes that did the best this year were the red zebras, romas and cherries. The giant yellow brandywine suffered blossom end rot and languished, like giant tepid yellow blobs on the vines. 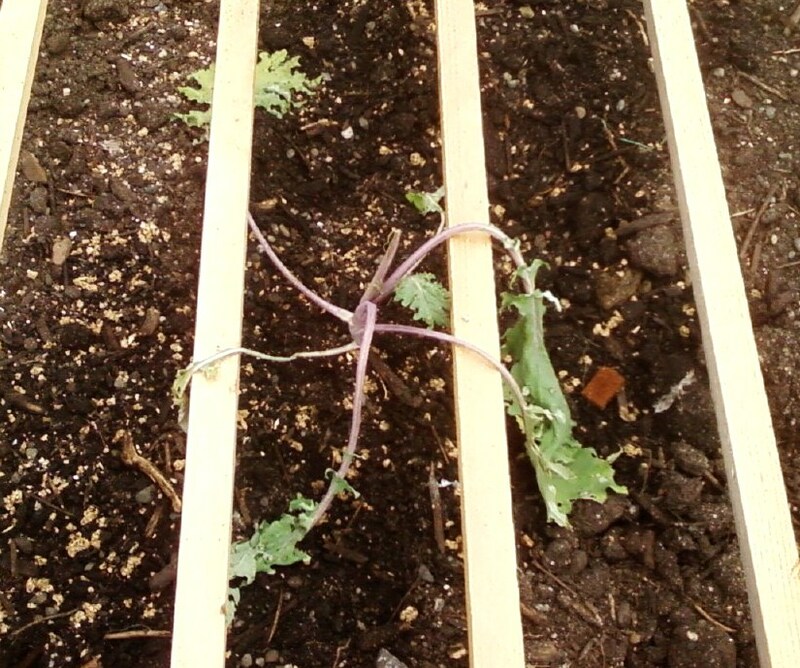 Other self-planted crops came up among the masses including fennel, celery and surprise, surprise, purple sprouting broccoli. In fact it's doing rather well. I was planning to sow in garlic and onion in this bed, but now I have a personal bet as to how long I can keep this broccoli going. Two plants have survived and re-sprouted. The stupid stuff just won't die! 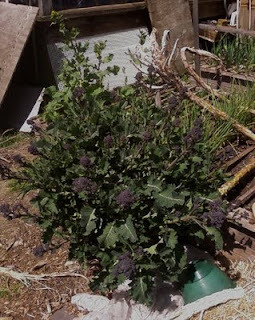 I envision purple sprouting broccoli with trunks the size of sequoias in a few years. I guess this is the official brassica bed, crop rotation be damned! I have several good recipes for fried green tomatoes and it's a darn good thing we both like them. I'm going to Google search for more recipes to use. I'm sure there are plenty and I'm sure a lot of them will be from the Pacific Northwest. 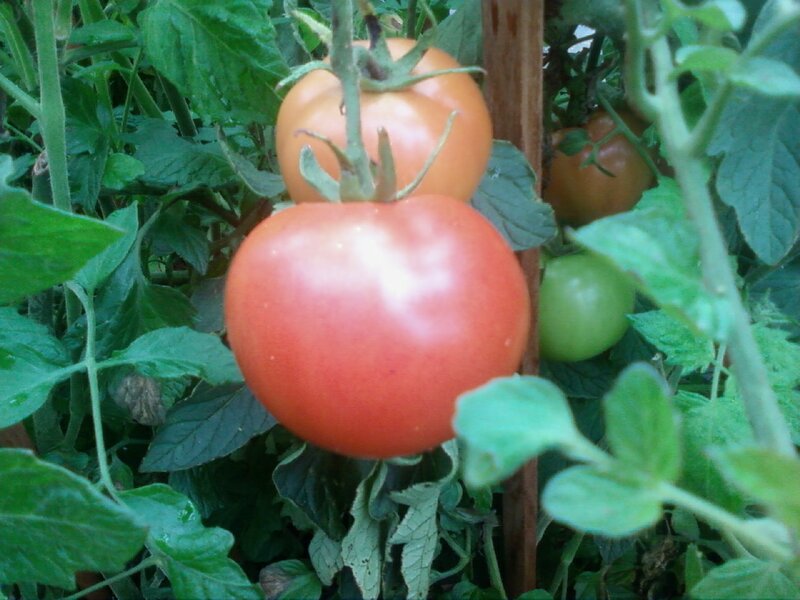 If you have any green tomato recipes you'd like to share, pass them along...please!!! Halloween at Mog Cottage is always exciting. We decked the place out, converting our planting beds into makeshift graves with all the Styrofoam molded headstones, bones and ghouls we could manage to scrounge up at the Dollar Store and the Used Food Store (What Roland calls the Grocery Outlet). During Halloween night, we place lighted candles under each head stone and up the front steps to light the way. Enough trick-or-treaters flooded our doorway to scarf up most of the candy, but not before we managed to OD on the stuff ourselves. Although Roland and I are pretty fussy about our chosen sugar delivery systems, the problem is we buy what we like and a lot of it, in anticipation of the costumed hoards of rug rats. On top of that, we buy it well in advance of the day it goes out the door because we want to make sure that what we want will be on the store shelves. When it comes to certain candy, neither of us has a bit of will power. Deep down, we probably don't care. It's only once a year, right? So, Roland and I scarf on sugar for a good week prior to Halloween,spend another week finishing off the leftovers, then another few days in withdrawal. Even our dog joins in, sneaking tootsie pops out of the bowl when we're not looking. We find sticky, artificially flavored corn syrup balls behind the sofa cushions among the stashed chewies. Yesterday, Roland discovered one of the confectioners thoroughly stuck to the side of our cat, Vinnie. He's now missing a sizable clump of fur trying to dislodge the thing. Now, I could attribute the theory that these fall/winter holidays are timed right to a candy industry conspiracy when carbohydrate cravings in many of us escalate. These companies know that seasonal darkness and it's ensuing depressive state drives people to pump up the dopamine levels among their grey cells. What easier way to do that than with a culturally accepted legal drug of choice: sugar. 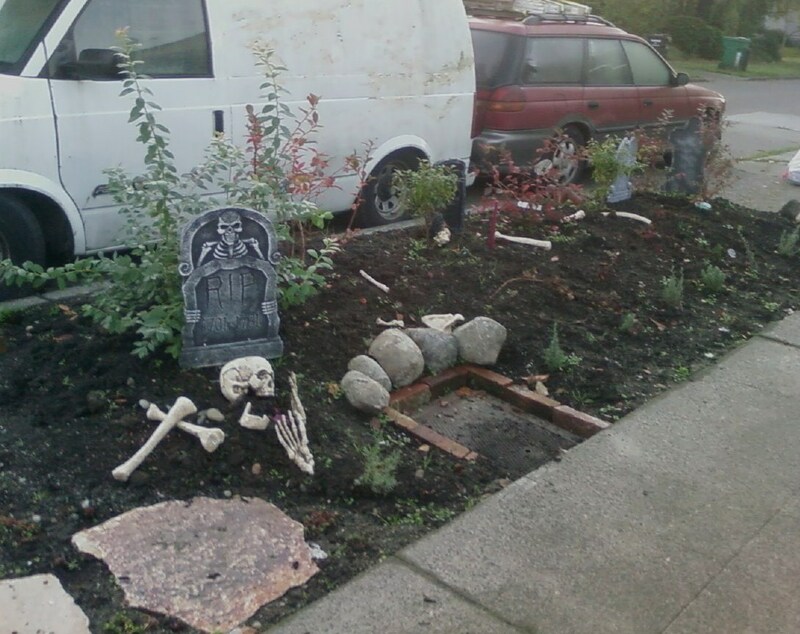 So the Halloween holiday often becomes fast, cheap and out of control. In fact, I consider Halloween a kick-off to the confectioners binge that continues until after Easter. People don't need candy much after that because the sun is back and people see the light. The next food binge after October 31st, of course, is Turkey Day. At least we have 3 weeks to come down from this holiday before the food fest. In the meantime, it may take that long to take down all the decorations. Hmmmm. 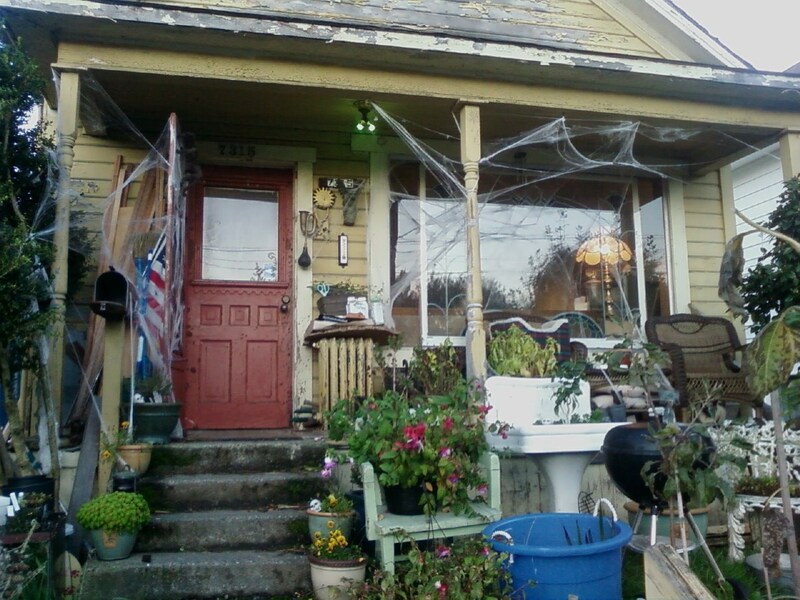 The hanging artificial spider webbing strung across the front porch rather suites the place, don't you think? 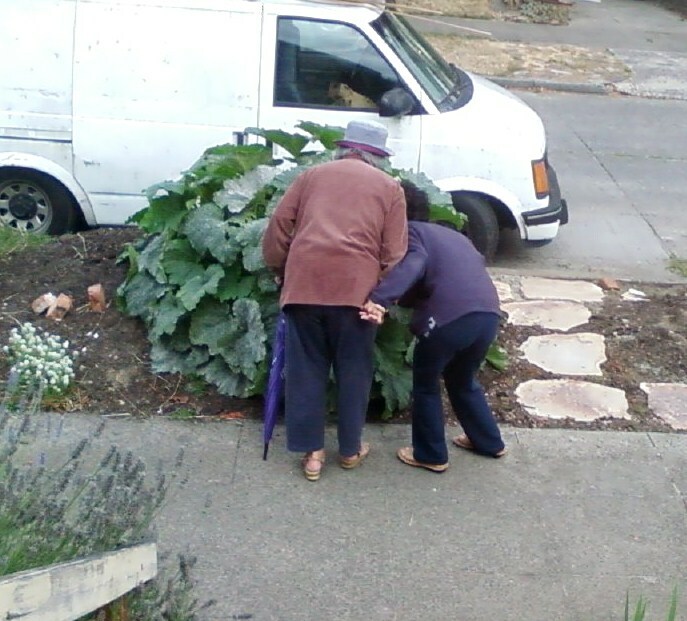 Since I've gotten into the horticulture game, I've been made aware of a fairly recent phenomenon; garden coaching. 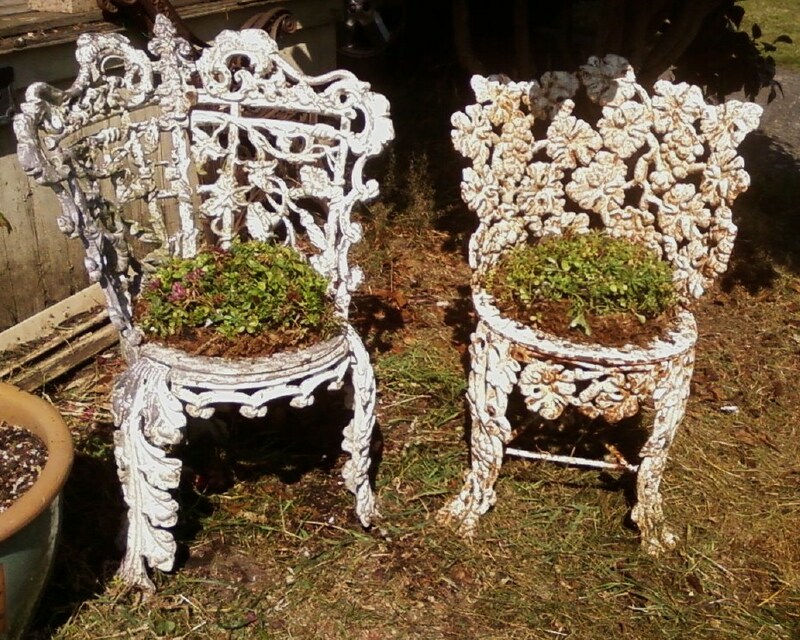 Now, the imagery that comes to mind are pot-bellied plant geeks with clip boards hovering over the gardener yelling encouragement over how to plant zinnias. Cheerleaders with giant dahlia-like pom-poms are doing their cheerleader thing on the sidelines. 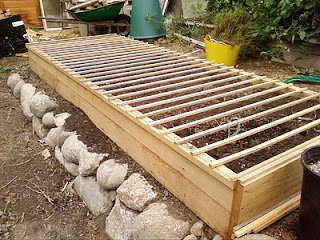 In reality, garden coaches are rather an outdoor version of indoor organization coaches; helping gardeners clear the clutter of their beds and come up with creative ways to use what they've got to work with. People pay big bucks for the advice. Last year I wrote about the difference between filers and pilers in the garden world (http://mogcottageurbanfarm.blogspot.com/2010/07/crop-rotation-according-to-filers.html). 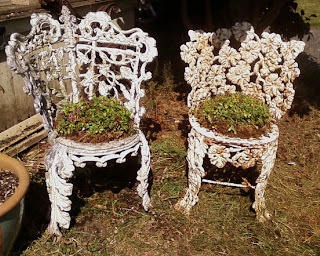 I think a major amount of a garden coach's clientele are pilers. Filers may hire a coach as a desire to balance their lives with some piling attributes such as, lightening up about gardening. Pilers want to incorporate filer attributes such as, incorporating some order into a hodgepodge called a mixed border. The concept of mixed borders must have been invented by pilers. Pilers often can't make up their minds because they want everything and are subject to impulse buys at the nursery. They just know that they can fit that fancy new cultivar somewhere. It's hard for pilers to edit out plants. They gravitate towards an Italian style that one of my hort. instructor calls "Oneofeachie." Filers can't make up their minds in fear of making the wrong choices. They're often so worried about making the wrong choices, they often do, at least in their minds. I usually get free plants from filers. I only get free plants from pilers after they've seen a garden coach. I guess that makes me a piler. Guilty as charged. We've been letting plants come up where they may in the lavender beds this year. Included in the rogue plants are several beautiful purple poppies (and the California variety that gets promptly pulled out), a wayward Russian kale and a giant sunflower. 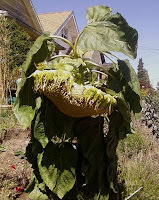 The sunflower is the most impressive with a 3 inch diameter trunk and a flower that's at least a 19 inches across. I attribute its enormous size to its DNA but also to the fact that it planted itself close to where we recently planted our cat, Bonnie. Cat's grow giant sunflowers, I guess. The rose we planted over her isn't doing to bad, either. Unfortunately, the public walking up the sidewalk isn't able to ponder its incredible size as the flower head started facing due SW, away from public view and now its weight has given it a droopy, sad presentation, sort of Charlie Brownish. There's evidence of squirrel activity, though. Empty seed shells have been discarded in the depression around the top rim of the bloom. The squirrel sits up there and reaches under for the ripening seeds. Luckily, he can only reach under so far, so hopefully he won't get them all. But there is evidence of the varmint chewing his way down the bloom! Luckily, mostly collect the seed for next year's planting rather than to eat. They're just fun to grow. 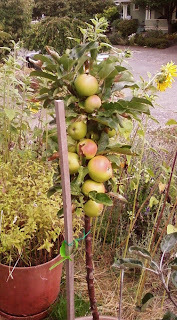 This particular plant might have been planted by that very squirrel, last Fall, which is rather funny that he picked the largest variety to perpetuate his food stash this year. Admittedly, we've been feeding a squirrel on our front porch for dog entertainment. It sits just outside the front window staring at our dog, Snorky popping a gasket barking at it and bouncing around the back of the sofa, frustrated with the glass barrier. When the squirrel alarm goes off, we toss some peanuts on the porch. The fun lasts about 10 minutes, then Snorky spends the next hour keeping vigilance in case it comes back. He sits on the top of the sofa back with his front paws draped over the wood frame, head resting on them like a bored kid hanging on the back of church pews. The whole routine usually ends with snoring noises coming from his direction. Our useless cats sit on the porch and watch the whole thing happen without moving a whisker. The squirrel is so brazen that it literally climbs over the cats to get to the randomly tossed peanuts, acting as if they are part of the furniture. I guess that's what happens when they're all well fed. It's been a long winter, as most of you have probably come to that realization on your own. Here in the PNW, it's been rain with a chance of sun this Spring. June temperatures have barely left the 50's much of the time. Now that June is behind us, July is actually starting out rather nice, a phenomenon that doesn't usually happen until July 5th. Now that the weather's been getting warmer, it's evident that the weeds have been waiting in ambush; tiny miniature landmines waiting to explode at the first opportunity. 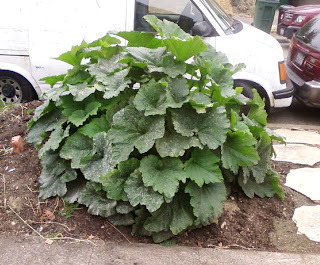 One minute you're contemplating what to plant in all those empty spots in your garden (OK, well last Fall), then you wake up to the answer that nature gives: super sized weeds in every nook and cranny. Some are well over 5 feet tall. They're making up for lost time this year. Somewhere in this explosion are specimens I have actually planted such as, blueberries, weigela, iris, and several perennials, but you'd never know it. In fact, I had forgotten exactly what is there as I haven't been paying too much attention to the beds over the winter. It was Christmas in June, as I uncovered cultivated surprises underneath the spurge. Common knowledge among horticulturists is that weeds indicate a disturbed soil. I think in this case, weeds indicate a disturbed mind. How many of us have started grandiose projects that languish for years because we have more ideas and ambition than time. 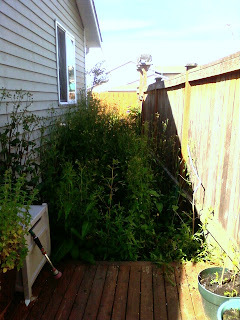 Part of what's supposed to be where the weeds have taken over is a path to the deck. These beds have been a work in progress since I've been in this house for over 10 years. 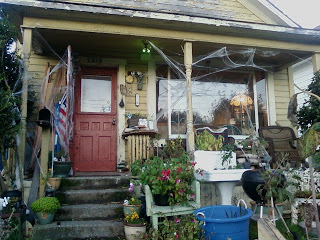 I've been spending most of my time at my BF's place, Mog Cottage in Seattle, that my place has been mainly a mail stop. Having started this project in the front section in the courtyard, I have around 90 feet to go to the deck. 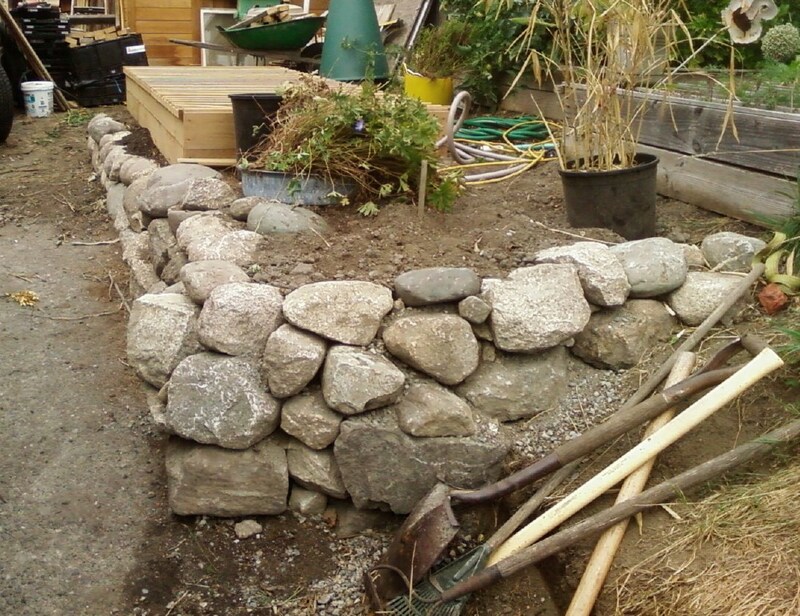 Do I want to lay a simple gravel path? No! I want to do something with stone and brick as an artistic expression, silly me. So, with everything else in my life, this project has found itself continuously put on hold. 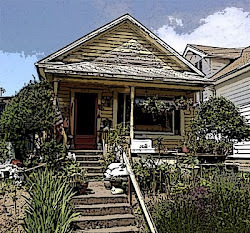 When I do have some time, I find myself getting out of the weeds (if you're not familiar with culinary terms, being 'in the weeds' indicates being overwhelmed in the kitchen). 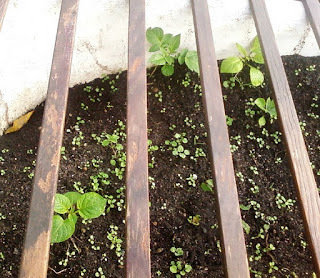 Spending hours yanking out butter cup, nightshade and spurge, it's a never ending battle. Some weeds are easy to yank out, while others, such as that hideous buttercup, spread by the most minute root remnant left behind. It doesn't help that I don't like to use chemicals. The water table here is very high and the neighborhood borders a wetlands. I've stuffed my yard waste container and waited an entire week for it to get emptied so I could stuff it again. To add insult to injury, Waste Management missed it this week. Now I've got piles of pulled weeds waiting to get gathered up and disposed of in the yard with no place to go until after next week. I guess I'll double up with additional bins along with the yard waste container pulled out into the middle of the street so they don't miss it! The garbage dude's name must be Murphy. Once again China's food practices hit the news, but instead of poisoning people or animals things blew up farmer's faces, so to speak. Apparently farmers in the Jiangsu province got a little over indulgent with the growth enhancer, forchlorfenuron, on their watermelon crops and along with higher than normal precipitation, created a perfect storm of exploding watermelons. Now, you might think that it's a major tragedy for these farmers to lose their crops, but producing watermelons from a country that values karma, you could say that their farming practices came back to bite them. The desire for higher yields and faster production for the market activated the greed gene and now they've lost their entire crops within 3-4 days. Pow, pow, pow, pow. Being one who appreciates black humor, I couldn't help myself but break out in hysterical laughter upon hearing about this incidence as I visualized water melons exploding in the fields like land mines. Perhaps future harvests will have to be done from armored vehicles. Looking at the photos of the aftermath, I'd say some of the melons resembled big red and green popped popcorn. Many were simply cracked in pieces. 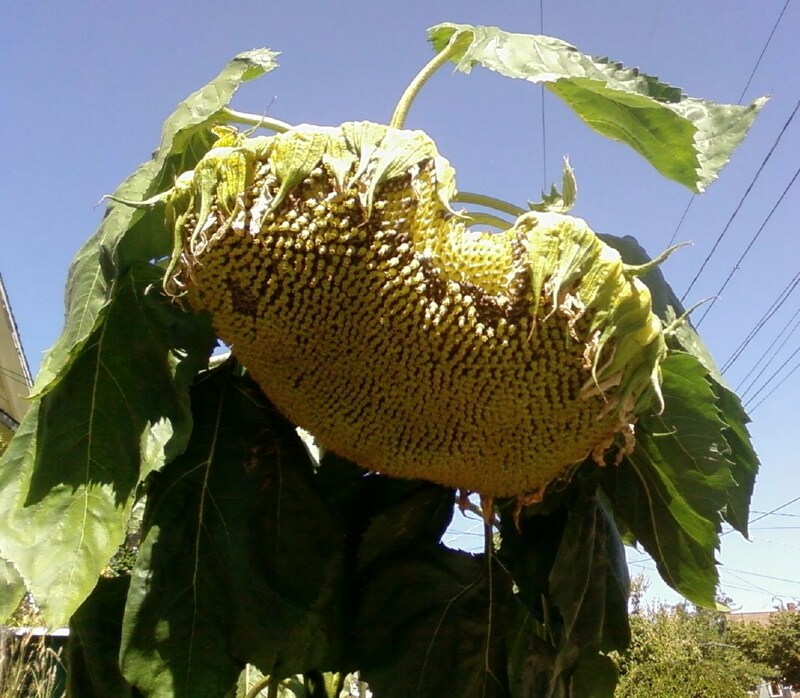 The farmers want to blame the seed that came from Japan, as apparently some of the melons that didn't get sprayed with the growth enhancer also blew up. The melons that were sprayed started exploding within a day or two of the treatment. Of course there is the possibility of drift or chemical leaching into neighboring farms. As investigators have not come up with a solid reason for the exploding melons, I can't help but think that, as with most agricultural catastrophes, it's probably a combination of things; weather, temperature, timing, ignorance and in this case, growth enhancers. A lesson in humility? perhaps. It is also a lesson in how better farming through chemistry often isn't. Mother nature always wins and it's better to work with nature than try and always control it. Bad farming practices have plagued agriculture since its beginnings. Human fixes seem to present unintended consequences causing more problems that require fixing. This seems like just another example of human hubris. 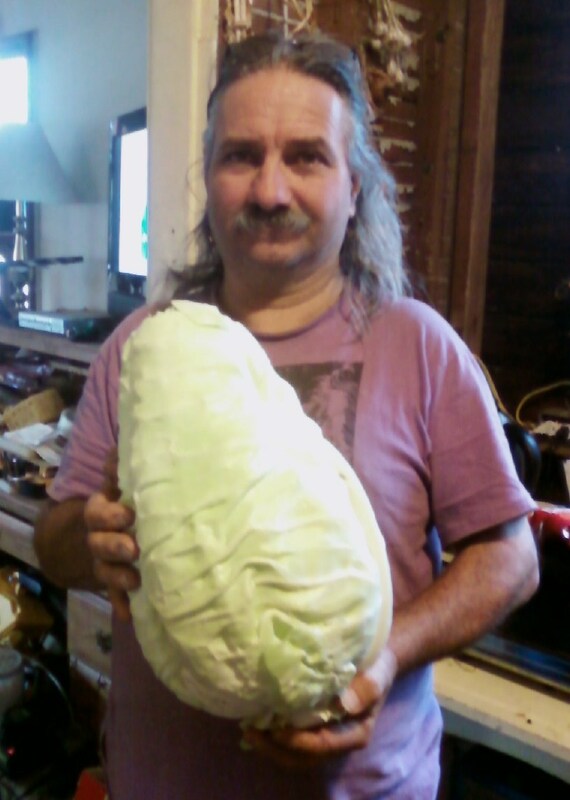 A lesson for us PNW veg gardeners? Since we don't grow watermelons on this side of the mountains this particular crop isn't an issue for us. But with all of the rain we've been getting this year, don't use forchlorfenuron on your zucchini.